Mr. Hartley offered the invocation over the program and meal that was provided by Sweet Basil. Following the served meal, Junior High Coach Dan Alderton welcomed the huge crowd of Junior High parents and players. 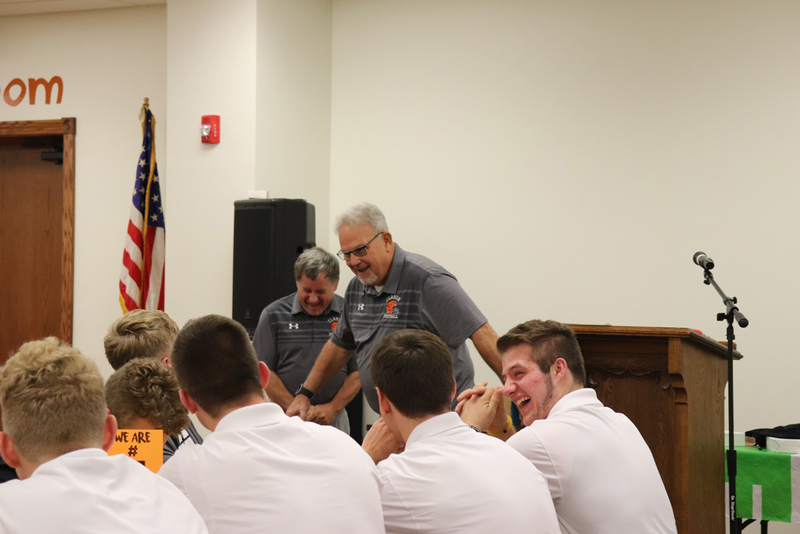 He spoke of the incredible season, including a few game highlights and the wonderful opportunity through the co-op with neighboring Clarion-Limestone families. 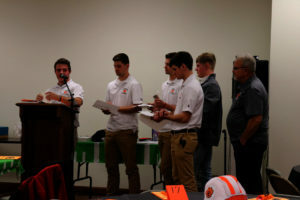 A season that was not as much about wining as it was coming together, getting to know each other and playing as one unit on the football field. 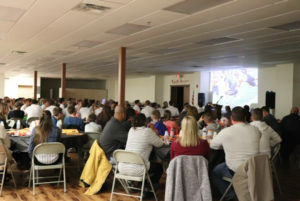 A video highlight served as the transition into the varsity presentation. The game footage was provided by two local team photographers, Gary Wiant and Bri Nellis. In between the Junior High and Varsity presentations, Mr. Hartley had a few game challenge questions for the audience and winners received a tee-shirt for the right answer. 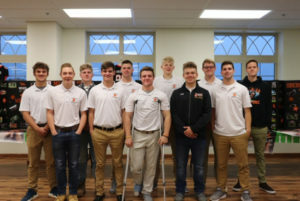 Coach Larry Wiser and Athletic Director Nancy Mills awarded certificates to the three Bobcat players whom were the first ever Bobcats to be named to the District Nine League Large School All-Stars; Archer Mills, Sam Minich and Nick Porciello, each received two designations on the list. 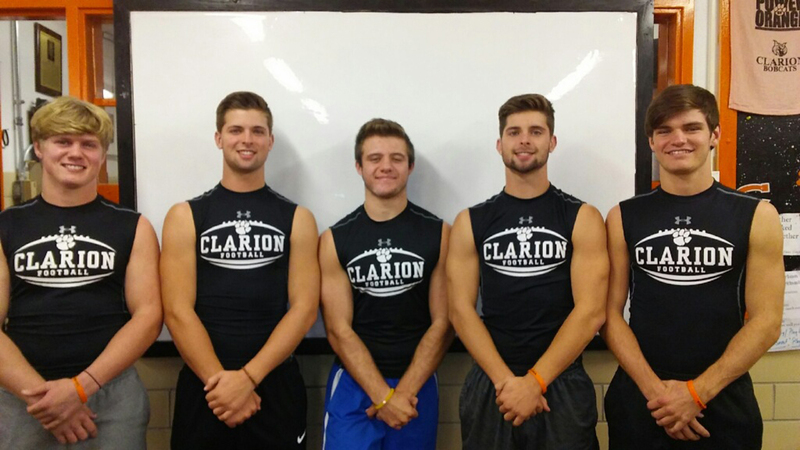 Archer Mills and Nick Porciello had the privilege of being named last year in the final year of the KSAC All-Star recognition for Clarion Bobcat Football. To keep engagement for our families, the Boosters offered several silent auction baskets from the University of Pitt, University of Arizona, Penn State and a Bobcat Fan basket, at which time, the winning bidders received their selected item. The traditional gag gifts presented by Coach Larry to the individual players rounded out the awards presentation. Dave Hartley concluded with some statements with the following: “Parents, you generously supported our Football Booster Club. You gave your time graciously and never refused, when asked, to provide food, dessert, drinks for our many team feeds. Most importantly you were present with your cheers, financial support and inspirational support for our team. We Are Bobcat Football. To our coaching staff and your families a huge thank you.” Dr, Hartley then asked those in attendance to patronize all the local team business sponsors in our community and thank them for their support. 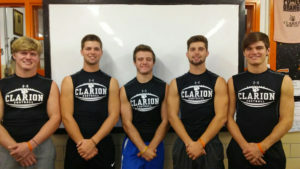 (Note: Mrs. Porciello and Mrs. Cherico shared with CSZ a summation of what they have concentrated on as far as an emphasis on Bobcat Football at all levels (Junior High, Junior Varsity and Varsity): “We have spent the year working on the concept of ‘We are Bobcat Football’ regardless of the team you son plays on. As such, a Bobcat Football player has a tradition to uphold both on and off the field.